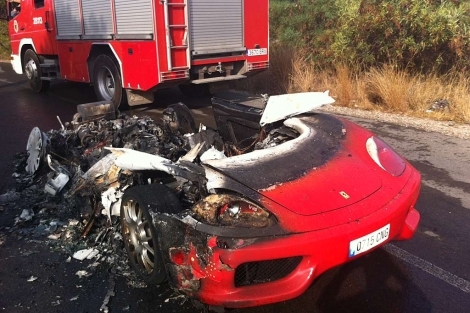 Seems some soccer player in Spain was tooling around the ‘ville when he saw flames in the rear-view mirror of his Ferrari. No, not a Renault Fuego…mi Modena esta en FUEGO! Read the article here, amigo. As we know, Italian cars love to burn up the road. See: here and here. This entry was posted on July 31, 2012 at 4:14 am and is filed under Automobiles. You can follow any responses to this entry through the RSS 2.0 feed. You can leave a response, or trackback from your own site.